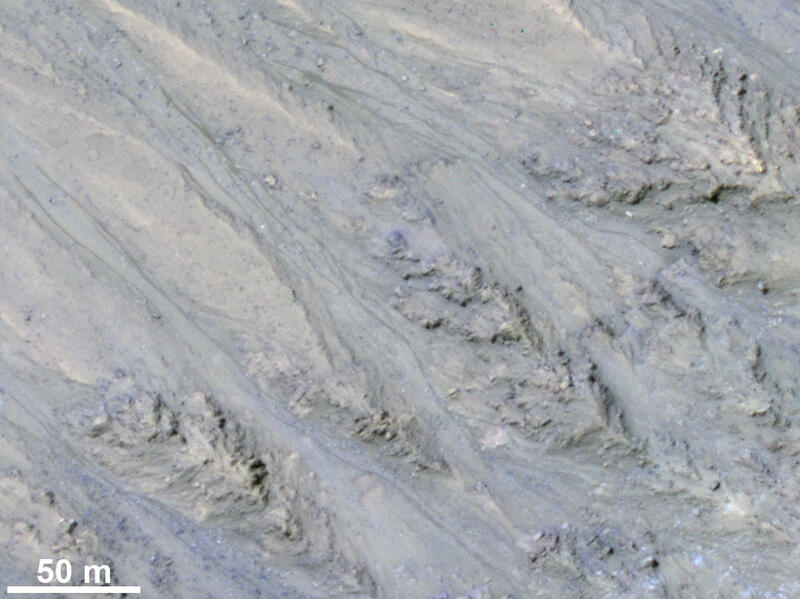 This HiRISE image cutout shows Recurring Slope Lineae in Tivat crater on Mars in enhanced color. The narrow, dark flows descend downhill (towards the upper left). Analysis shows that the flows all end at approximately the same slope, which is similar to the angle of repose for sand. Image ​Credit: NASA/JPL/University of Arizona/USGS. November 20, 2017 – Dark features previously proposed as evidence for significant liquid water flowing on Mars have now been identified as granular flows, where sand and dust move rather than liquid water, according to a new article published in Nature Geoscience by the U.S. Geological Survey.